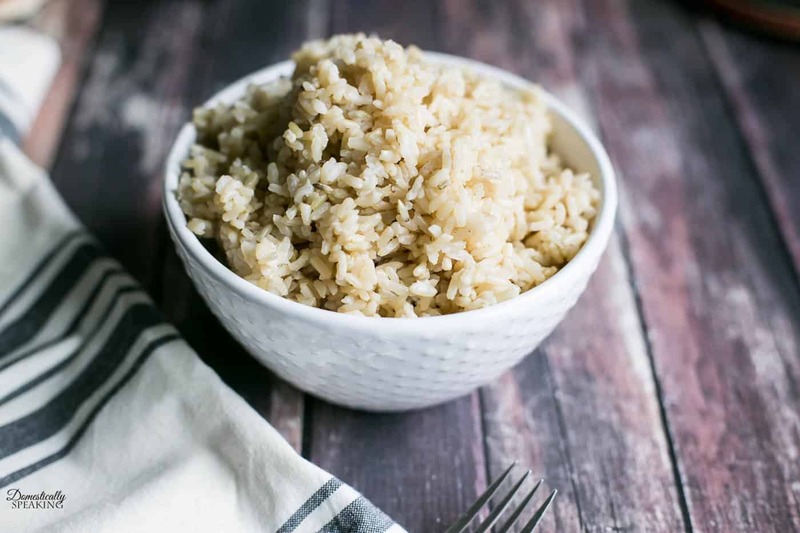 This Instant Pot Brown Rice recipe is so easy to make! My husband loves brown rice. Each week I make up a big batch for him to use in his lunches. After purchasing my pressure cooker I decided to try out brown rice in it. I found that cooking brown rice on the cooktop was a challenge, especially with a big batch. 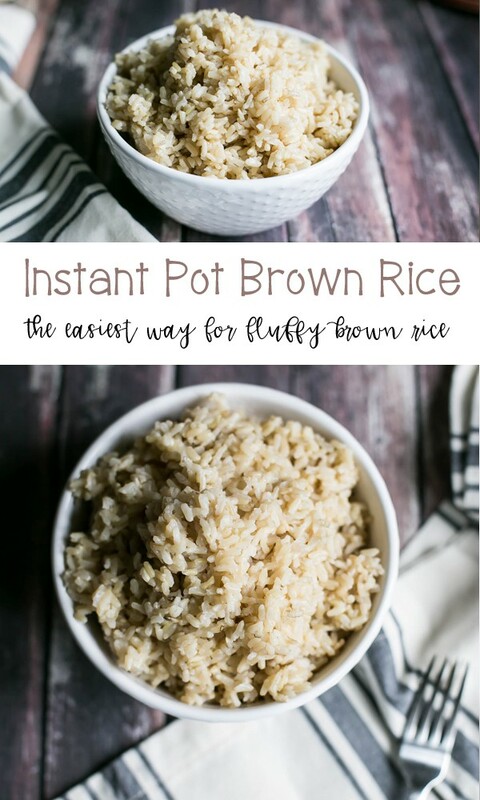 With an instapot, the brown rice is a breeze! Brown Rice takes long to cook than jasmine or long grain white rice. I’ve found that cooking brown rice in the pressure cooker makes it a little fluffier, than the stovetop. Brown Rice definitely has a different texture. It is a is whole-grain rice with the inedible outer hull removed. 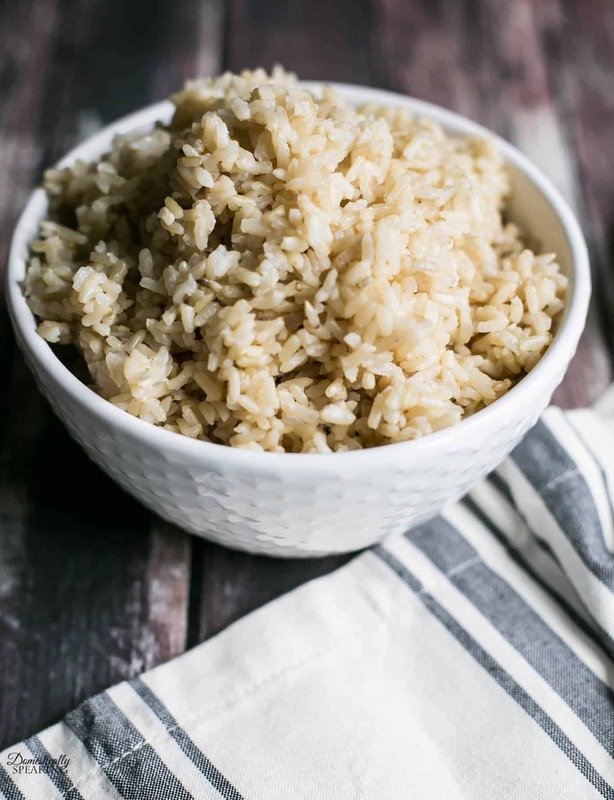 Brown rice is a whole grain and a good source of magnesium, phosphorus, selenium, thiamine, niacin, vitamin B6, and manganese, and is high in fiber, making it a great addition to your diet. It’s a little chewier, but it’s a way to add more fiber and whole grain in your diet. Pressure Cooker: This is the one I own and I’ve been very happy with it. I love that it’s an 8 quart size. I can cook up a bunch of chicken for the week, make a big batch of soup, etc. Rice Paddle: Rice Paddles are great for scooping out your rice servings. I love that this one is non-stick. Storage Bowls: Since I made a big batch for the week, I love these tupperware bowls for storing my rice, cooked chicken, etc. This recipe is SO easy friends! That’s it! I set my pressure cooker to the rice setting, which is 15 minutes for brown rice. 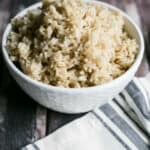 Such an easy way to make brown rice using your instant pot / pressure cooker! Pour the rice and water into the pressure cooker pot. Stir to combine. Place lid on pressure cooker and make sure that it is sealed properly. If your instant pot has a rice setting use that for 15 minutes, or use manual for 15 minutes. Once the pressure cooker has gain pressure and cooked for 15 minutes, let the pressure cooker naturally release for 15 minutes (meaning just let it sit). Release the remaining pressure by relieving the value with the end of a wooden spoon. Open the lid with an oven mitt. Use a fork to fluffy the brown rice. Serve immediately or let it cool 20-30 minutes before storing. 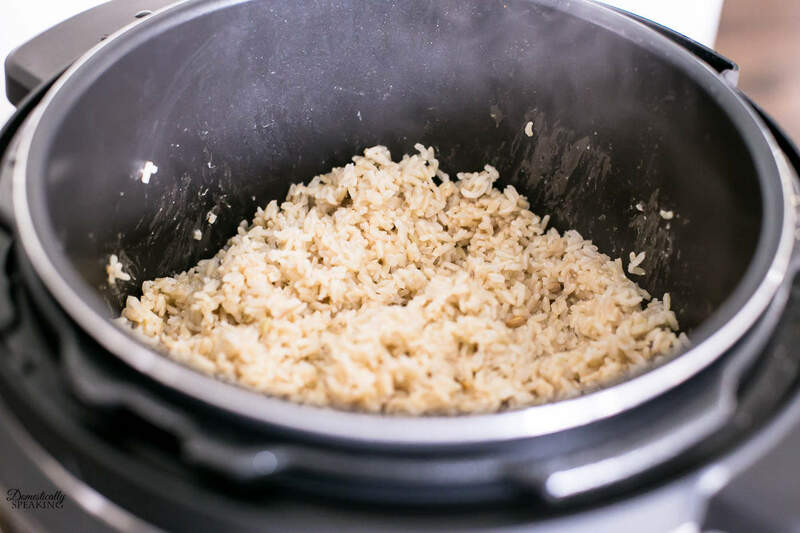 I hope you enjoy this pressure cooker recipe for brown rice. Check out my Pressure Cooker Spicy Ribs too – they are so moist and delicious!